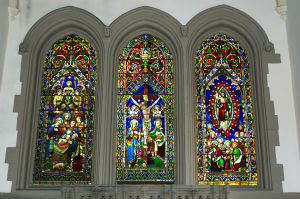 Christ Church has some of the finest Victorian Stained Glass windows in the area. Below are the pictures and the story's they tell. The altar is the focus of the Communion Service where each Sunday we follow Jesus commandments at the last supper: “Eat this bread and drink this wine in remembrance of me”. The 3 windows behind the altar use simple pictures to tell Jesus’ life story which is what we believe, in events we remember at particular times of the year. 1. He was born as a human baby to be a sacrifice (the lamb) - Christmas. 2. He loves each person so much that he died on the cross for us (the skull) so that we are able to approach God- Good Friday & Easter. 3. He rose from the dead and is now with God to welcome us (pointing our way to heaven) – Ascension & Advent. Greenups’ mill was built for William in 1793 and is the earliest known woolen mill in Yorkshire which carried out the complete processing of material from fleece to cloth. The family became successful, very wealthy merchants mixing with the other rich Victorian “celebrities” and philanthropists in Halifax. This expensive window with its picture of a lamb was perhaps a reminder of the wool from which they made their fortunes. William Greenup was involved in the re-siting of Christ Church on this site in 1817 and also supplied land for the building of the National School in Sowerby Bridge in 1837. Elizabeth was George’s wife and they lived at Darcey Hey, Skircoat. The Greenups died and their children moved away. The mill continued until it was destroyed by fire on 17th May 1867, whilst operated by C. Scholefield with the damage estimated at £7000- nowadays that would be equivalent to £500,000. Charles Rogers, born in Leicester in 1793, was vicar from 1829 for 33 years until he died. Sowerby Bridge grew rapidly in this time: between 24/12/1848 and 3/4/1857 he personally baptised over 1000 babies. He and his wife Cecilia ran their own school, from what is now Beech House on Beech Road, and later ran the National School in Sowerby Bridge, on Tuel Lane. They had four daughters including Cecilia who married Thomas Pollit, elder brother of Joseph Pollit (who founded Pollit and Wigzell a world leading steam engineering company). 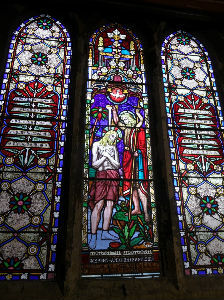 Both Pollits would have been amongst the family and parishioners who joined together to pay for this window. His company based at Rose Hill Works, on Beech Road, grew from leather cutting to making & selling oil cloth and tarpaulin. John was one of the last to be buried (in the grave of his first wife Elizabeth), before the churchyard closed in 1859 due to its drainage being a public health risk. His son, Joseph Walton Wallis, continued the business and became chairman of the local board (of public health) 1868/69. He was wealthy enough to pay for this window for his father, and also one for his father-law, George Fearnley Esq. in the north aisle. John’s seventh child, Sophia who married Henry Tonge, is remembered by the “Fatherless” window in the north aisle. In the Church of England, baptism into the church is available for adults, children, and babies, who are held in the arms of the vicar. St John the Baptist was an outspoken prophet. His message “Repent and be baptised” is written in the glass. His role was to prepare people for the promised Messiah and he recognised Jesus as this person because of the miracles he did, calling him “The Lamb of God”. John attracted many followers but also criticised the Roman governor King Herod Antipas, who had him put in prison and beheaded. St John the Baptist’s symbol is a severed head on a plate, or a scallop shell linking to baptism. He has two feast days: June 24, and his beheading is remembered on August 29. He is also recognized as a prophet in Islam and Sufism. Thomas Pollit was born in Manchester and was a dry-salter, dealing in dye chemicals, probably for the textile industry. In 1797 he married Mary, the daughter of Timothy Bates, who had one of the first large engineering firms, Bank Foundry on Wharf St. Mary died in 1811, and his son Joseph, born 1814 by his second wife Susannah, went to work for Timothy Bates’ company. By 1865 Joseph had inherited his grandfather’s estate, foundry and company and joined with Eustace Wigzell, as a partner. Wigzell was an engineer from Greenwich who built and tested navy warships, looking for a supply of iron to produce railway bars. In 1846, another son of Thomas, also called Thomas, married Cecilia Rogers, daughter of the Rev Charles Rogers, who was vicar at this church. Their son Edward Ernest became church warden here and also the Managing Director of Pollit & Wigzell Ltd. It became world famous for building steam engines, and employed up to 500 workers at peak production, until steam power was superseded by oil. Edward died in 1931 in Leeds, and has a monument in the graveyard, by the tower. The firm closed in 1932. Dedication in the glass “John Wood in the memory of his father Nathaniel Wood, died 25/2/1851. Nathaniel Wood was a millwright, and is recorded in the first census in 1841 as 60 years old. His wife was Judith, with John their only son and three daughters, Susannah, Rachel and Hannah. John was a millwright too, but in 1861 was recorded living at 82, Greenups’ Terrace with his mother, Susannah and niece Mary. He was by then a cotton spinner and employer of 6 men, 2 boys, 5 women and 2 girls. By 1871 aged 54, he had married Sarah, and retired to Raven Lodge. Although we can’t be certain, church tradition is that Saint Matthew was both one of the 12 closest disciples Jesus chose to travel with him and the writer of the book in the Bible telling the life and teaching of Jesus. Matthew the disciple was originally called Levi. He collected taxes from the Hebrew people for Herod Antipas, the Roman official ruling over Galilee. His tax office was located in Capernaum, near what today is Almagor. As a tax collector or a “publican” he worked for the Romans deciding what to charge, and used their soldiers to make sure everyone, farmers, shopkeepers, and merchants paid. He like many tax collectors wasn’t paid a wage but could keep a big profit for himself. He was rich but hated by everyone. When Jesus challenged him to give up his high powered job and follow him, he did so immediately. “Levi” is a very old Hebrew name meaning “attached” and associated with the elite tribe who were priests in the Temple. This person changed his name to "Matthew" meaning "gift of the Lord” and made a completely new start. If this is Matthew who wrote the gospel before 70 AD, the timing would fit. He would be ideal as a “news reporter” being used to noticing details and recording them accurately. He would have been literate in Greek, the language used in the market place as well as Aramaic the language used by Jews, and in which Matthew’s gospel is written. Matthew tells what Jesus did using Jewish scriptures and history to convince a Jewish audience that Jesus was the person they had expected God to send – “the Messiah”. 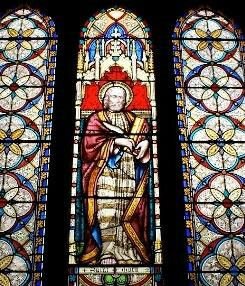 St Matthew is the patron saint of tax collectors, accountants, civil servants and people working for the government. The Feast of St. Matthew is celebrated every year on September 21. In Christian art his symbol is an angel, often with wings or carrying a book, depicting using reason and thought to approach God. This is taken from the book of Revelation’s picture of God ruling in heaven. 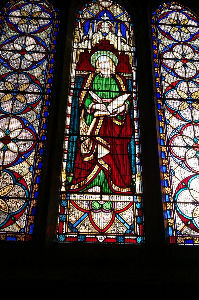 St Mark is the second gospel writer remembered in the windows in the South Aisle. 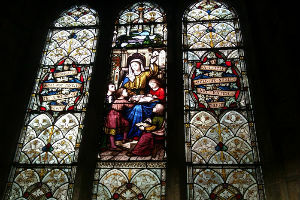 Only St Matthew’s window has a dedication, but it is clear that the four form a series and were commissioned together, in the 1860s by the church members. 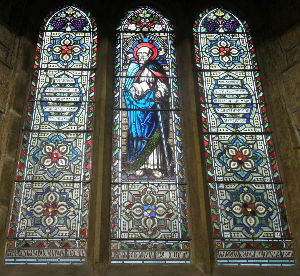 The windows for Mark, Luke and John have been restored, after being smashed by vandals in 1991. Mark’s gospel is the shortest and the one written most closely after the events around the death of Jesus, around the year 60 A.D. Like Luke, Mark was not one of the 12 closest disciples who travelled with Jesus throughout his three years of teaching in Galilee. The tradition in the Coptic Church, confirmed by the historian Hippolyta of Rome is that he was one of the 70 disciples that Jesus sent to spread his teaching around Judea in Luke 10v1. It is likely that he and Luke knew each other. Mark is closely associated with Africa, and may have been born in what is now Libya. We know about him in the Bible from the book of The Acts of the Apostles 12:12 -“When Peter escaped from prison, he went to the home of Mark's mother”. Another historian of that time, Eusebius of Caesarea confirms that Peter was the first leader of the Christian church, and did escape from Herod Agrippa who killed the apostle St James. Mark is then known to have been in Rome at the same time as St Paul & St Peter. He is particularly linked to St Peter as an interpreter, and after Peter’s death, wrote down his sermons in Latin, probably for new Gentile converts in Rome. Mark emphasizes that Jesus was rejected by men on earth but was still successful in carrying out his task for God. His gospel sums this up in its first verse “The beginning of the good news about Jesus the Messiah, the Son of God. St Mark is the patron saint of notaries and lawyers. He is closely associated with Alexandria where he became the first bishop of the Egyptian Coptic church and founded the church in Africa. It is not certain how he died; tradition has that he was killed for his faith in AD 68. He is also associated with Venice, where the Basilica of St Mark’s now holds his body as a shrine. In Christian art his symbol is a winged lion, derived from Mark's description of John the Baptist as a "voice of one crying out in the desert" (Mark 1:3), which artists compare to a roaring lion, and also features in Revelation’s picture of God ruling in heaven. The Feast of St. Mark is celebrated every year on April 25th. 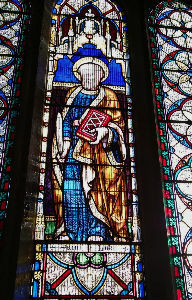 This window is third in the series of gospel writers in the South aisle. It can only be viewed from the vicar’s vestry and has no inscription. The Feast of St. Luke is celebrated every year on October 18. Luke was born in Antioch, Syria when it was a busy port and the third largest city in the Roman Empire. He was probably not a Jew, and definitely not one of the 12 closest followers of Jesus. We know from the letters of St Paul that he was a doctor. It is likely he spoke Greek and it is thought that both Luke’s gospel and the book of The Acts of the Apostles (written in Greek, as one continuous story) were written by him. The writer begins as a historian and only mentions eye witness accounts, using “we”, from the point when St Paul left Troas in the year 51. This fits with the theory that Luke became a Christian there, and followed St Paul in his journeys to start new churches around the Mediterranean. Luke’s gospel begins with “I too decided, after investigating everything carefully from the very first, to write an orderly account for you, most excellent Theophilus". If he was a “reporter” it is likely he recorded these extra details in his version of events and highlighted why Jesus was not just for Jews but for all people. Luke’s gospel has 6 miracles and 18 stories which are not found in the other gospels. He includes the angel visiting Mary, and her stay with her cousin Elizabeth before Jesus was born. He identifies Jesus as caring passionately about women, foreigners and the poor: nowadays, known as “standing up for social justice". Luke died in 84AD and was buried in a tomb, in Thebes. The bones in this tomb have been carbon dated to a date of death between 72 and 416. Some were then taken to Padua as holy relics, and are now kept in a shrine to St Luke. St Luke is the patron saint of doctors and surgeons, and also artists. This is because some early icons and portraits of Mary were rumoured to have been painted by him. In Christian art his symbol is an ox or calf because these are the symbols of sacrifice - a sacrifice he believed Jesus made for everyone. This is taken from the book of Revelation’s picture of God ruling in heaven. This window can only be viewed from the vicar’s vestry. It has no inscription. John is from the Hebrew name, Yohanan meaning Yahweh (God) is Gracious. He is remembered for his writings rather than as the patron saint of any place or activity. The Feast of St. John, the apostle and evangelist is celebrated every year on December 27. The writer of the gospel of John never identifies himself by name: he calls himself the “beloved disciple”, and writes like an eye witness to many private moments with Jesus, as well as the public teaching. If so, he is believed to be John, the younger brother of James, both sons of Zebedee and Salome. They were fishermen in Galilee, and John is thought to have been a follower of John the Baptist for some years before Jesus began his teaching there. John and his brother were nicknamed “the sons of thunder” perhaps because they were both noisy and quick to react emotionally. John was probably the youngest of the twelve apostles and the brothers often accompanied Peter the leader. They seem to have been friends but often competing to be closest to Jesus. As Jesus was dying, he is said to have spoken to John to take care of Mary his mother, and for Mary to look on John as her son. This close family relationship implies Jesus did indeed love John very closely. Peter and James began the job of leading the church, whilst John is reported as staying in Jerusalem until AD 52, possibly until Mary died. Historically the three letters from John and the book of Revelation are thought to have so much reference from an eyewitness that they must be the same John as had written the gospel. We can’t be certain but even modern experts think all the documents were written by the church in Asia Minor where John is known to have lived- in both Patmos in AD96 and then Ephesus until he died in AD98. It is reported by the early church that he was carried to the gatherings of the believers, and because of his old age, he only gave very short sermons saying, "My children love one another." He did not die for his faith as a martyr, but from natural causes when he was around 94 years old. In Christian art St John the Evangelist is most usually represented as an eagle. The eagle is thought to symbolize his inspirational writing, especially of the first chapter of John’s gospel. Sometimes he carries scrolls, rather than a book, perhaps because of the seven scrolls mentioned in the book of Revelation. In our church the Bible used for public readings every Sunday is placed on a brass lectern shaped in the form of an eagle with outspread wings. The memorial below this window gives more detail about the man described in the glass as “Johannis Fearby Haslam”. John went to Heath School, then aged 14, went for tuition to be a vicar to Rev J W Brooks in Retford, (Notts). He returned in 1828 to Sowerby under Rev W H Bull. Around 1830 he set up an evening school at Sowerby Croft, Norland, and a religious mission. He studied at Cambridge University; married Elizabeth Denton from Chesterfield and both went to Ceylon in 1838. He learned the native language to revise the Singhalese Bible and translated several other books. Norland church was closely connected to Christ Church in one parish for many years. Paul was born in Tarsus, now in modern day Turkey. It was an ancient, important city for the Persians and Romans, both for trade and learning. It had a University, and its people were considered Roman citizens. Paul was originally called Saul, and part of a very religious Jewish family. They were tent makers but also connected with the Pharisees who were highly trained in all the details of Jewish law. Paul would have been very well educated in both Greek & Hebrew, and experienced in speaking, negotiating and teaching in business and church life. Originally we know he did not accept the teaching of Jesus or the events of Easter. Paul did not believe the early Christians and persecuted them as liars who were corrupting the Jewish faith. He was present in Jerusalem when Stephen one of the 7 deacons was stoned to death by the most important Jewish court. A short while later he had completely changed his attitude. Luke describes this in Acts 9-known as Paul’s conversion on the road to Damascus. “He began to preach in the synagogues that Jesus is the Son of God …& baffled the Jews living in Damascus by proving that Jesus is the Messiah.” Once accepted by St Peter into the early church, he became an influential leader, teaching both Jews and many other races of people. Paul travelled widely as a missionary, establishing many new Christian groups around the Mediterranean Sea. Scholars think he wrote between 7and 14 of the books in the Bible. They are in the form of letters to these churches, known as Epistles, a type of writing used by teachers to debate. St Paul was imprisoned in Rome and died, possibly killed as a martyr, in AD 67. The Feast of St. Paul is celebrated on June 29. In Christian art he is often shown with a Bible as the word of God, and/or a sword, which he referred to in his letter to the Ephesians as “The sword of the Spirit”. It seems very appropriate that Rev. 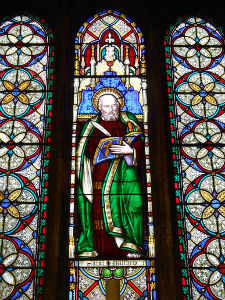 John Fearby Haslam, who died as a missionary in what is now Sri Lanka, is linked with St Paul’s window. Originally this window was in the South Aisle with the other gospel writing saints, until placed here when the font was moved. Sophia, daughter of John Wallis, who married Henry Tonge, did live at Willow House at this time and by 1869 she had two children. The apostle James is writing to the early Christian church about “Listening and doing”. He means that it is not enough to hear the ideas that Jesus taught but that Christian believer s should put them into practice. In particular they should not be selfish, but help those less fortunate with “charity”: this originally meant a selfless act of love. Some wealthy Victorians took this to heart and set up charities for education, health and better housing for their workers’ families. Henry Alexander Norris, a manufacturing chemist married Jane Hope and in the 1861 census the Norris family were recorded as living at Mearclough House Sowerby Bridge, with one son Charles Hope, born 15 March 1860. Sadly he died on 10 January 1865, before the age of 5. By this time they had also buried their second child Katharine Evelyn, born 11 June 1862 who died aged 5 months, and their son Henry Alexander who died 7 April 1865 aged 10 months. They also had a daughter, Gertrude Mary born 6 March 1866. In those days 3 out of every 10 babies died before reaching the age of one year, and living near the polluted River Calder must have been very unhealthy. The town was full of factories, discharging smoke into the air and waste into the river. Christ Church graveyard was first used for burials in May 1821, but by 1857 the graveyard was closed because it was full. 1730 people had been buried here by March 1861 when the new cemetery off New Road was opened. 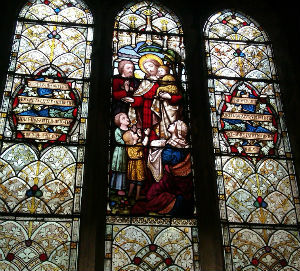 The Norris family moved to Halifax, and this window is left as a memorial to their children who had been baptised by Rev Charles Rogers, the Vicar Of Christ Church, and were buried in this parish. In 1871 they were living in a much nicer area at Rockcliffe House, 25 Birdcage Lane. This building is now known as “Gleddings” school. On the night of the 1881 census the Norris family recorded Gertrude and two other healthy children, Hilda Frederica (born 1872), and Arthur A, (born 1875) living with them. A boy called Charles Henry Hope aged 12 but is described as a “nephew” - he would have been born in 1868 or 1869. A niece, Beatrice Mary, aged 13 from Oaksey in Wiltshire is also recorded staying there. She was the daughter of Henry’s brother –the Rev William Arthur Norris who was Rector of Oaksey, and was born in 1867. The family were wealthy enough to have Harriet Beet, Mary Ann South and Jane Anne Disher,” also staying there, recorded as three “live- in servants”. By 1873 Henry Alexander had become a partner in a firm of solicitors, Norris, Foster and England in Halifax. Charles Henry Hope continued to live in Sowerby Bridge, and is referred to as a son, and brother of Arthur. John Holdsworth of Willow Field, Skircoat 1869. We know little about him. Little children learn as they copy what they see and hear from those around them who they trust. This way of learning is how Jesus expected his adult disciples to learn, and he encourages them to pass on what they know by example. The window scene is of a Victorian Sunday school. The teacher is pointing to the 10 commandments, carved on two stones by Moses, which the children are learning by listening, then reading and writing on a slate.